This is a 50-minute speaking and multimedia presentation followed by questions and answers. We’ll look at foundations for civic involvement, objections, and a practical action list. Just like Joseph, Daniel, Paul, William Wilberforce, and many of our Founding Fathers, we ought to pray first…and then rise to serve. I start off by laying some theological and historical foundations. Video clip of the first inauguration of President George Washington. Part two gives answers to many of the objections offered to civic involvement. Objection #1 - Our Constitution calls for the separation of Church and state. Objection #2 - Corruption in politics will corrupt the Church. Objection #3 - I just vote for the most compassionate sounding candidates. That's enough. 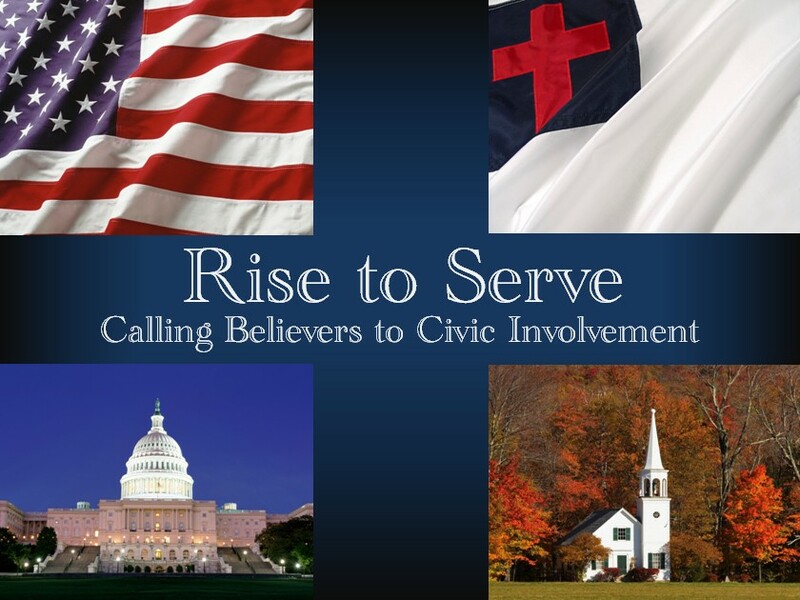 Objection #4 - Civic involvement will weaken our church ministries. Objection #5 - If I show patriotism, I'm not truly loyal to Jesus Christ. Objection #6 - Government is evil and the world belongs to Satan, so we need to focus on Christ. The we wrap up with very practical action items to show people how simple it is to get involved and how wide open the door. Involvement Tip #1 - I bring me. Involvement Tip #2 - Limiting the power of the courts by appointing "originalist" judges is the most important issue facing the nation today. 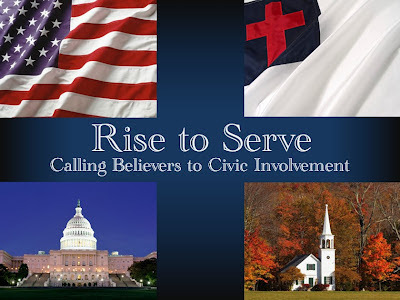 Involvement Tip #4 - Add "citizens" to your prayer list for authorities. Follow-up Q&A of 20-30 minutes is recommended. Click here to jump to booking information. The multimedia presentation requires sound, video projector, and screen. I can travel with equipment for small groups (up to 40) if I'm just in central Wisconsin with my van. Otherwise, I'll work with your tech people to meet the equipment checklist.